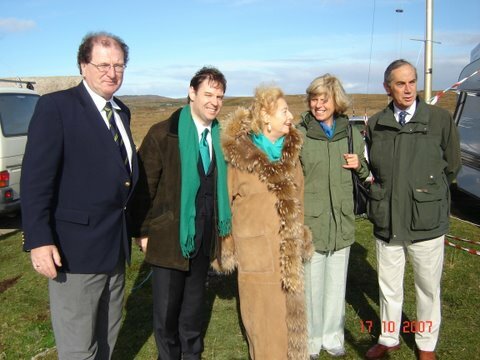 Clifden 17th October 2007, 100th anniversary of first commercial transatlantic morse transmission. L to R: Colman Shaughnessy ROA, Guglielmo Marconi (Marconi’s grandson), Princess Elettra Marconi (Marconi’s daughter), Lady Jameson (Marconi’s mother was a Jameson), O’Brien (current Lord Inchiquinn of Dromoland Castle Co. Clare) — Marconi’s first wife was O’Brien of this dynasty. This is thought to be the first family meeting in 75 years.